SDH commemorates the achievements of graduates annually. SDH and VATEL celebrates the this great occasion with the graduates, parents, friends, and guests to mark this major milestone. 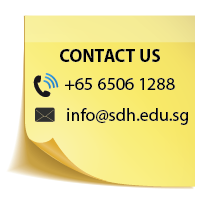 This year, our graduation day is a special one as we concurrently celebrate SDH’s 10 Year Anniversary. Graduation day is an exclusive occasion as it signifies the beginning of a new journey for graduates, ready to take on new challenges and seize great opportunities. 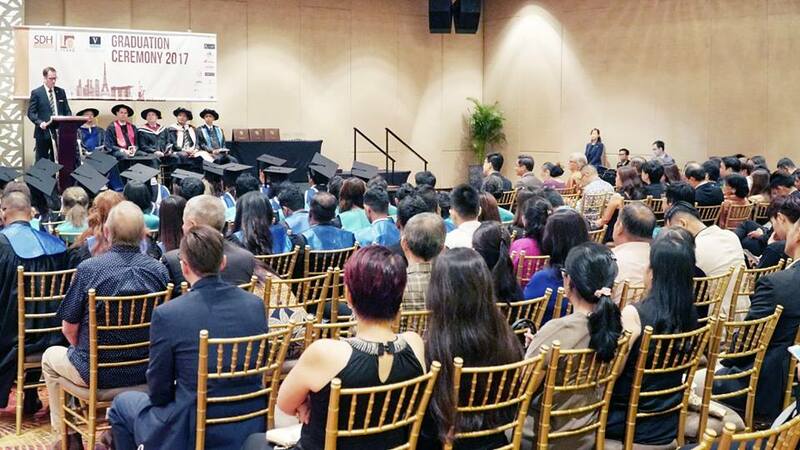 On this joyous day, graduates dressed to the nines arrived at Mandarin Orchard Hotel to put on their graduation robes and busk in the glory of their academic accomplishments. Jeremie Rossignol, Director International Network of VATEL arrived to give an empowering speech and to present awards for beaming VATEL graduates. This year, we have 2 recipients (See List) for SDH Academic Distinction Award, and 1 recipient (See List) for SDH Outstanding Student Award. To add on, SDH has newly established a new accolade named as SDH Outstanding Alumni Award to recognise outstanding alumni students who have distinguished themselves by excelling in their leadership, engagement, and have made exemplary contribution to the tourism industry. This prestigious award was presented to Pakalapati Venkata Rama Bhadra Raju, who is also known as Mr Arun – as he is currently one of SDH’s lecturers. MBA in International Hotel Management Graduate, VATEL. Guests were then told to go over to the other ballroom where the 10th Year Anniversary Dinner was about to commence. The dinner began with a 5 minutes video that encapsulated the 10 years of achievements by SDH, highlighting major milestones and students’ vibrant activities. This was followed by an interesting and intriguing speech by Mr Chia Tuck Keong, our SDH Institute. During the dinner, our 3 champions – Xie Pei Ting, Thae Yu Yu, and Mandeep Kaur, displayed a marvellous performance, impressing all guests in the ballroom with their smooth manipulation of bar tools, excellent bartending skills, and superb showmanship. All eyes were fixated on these 3 ladies as they worked their magic professionally. Their drinks were presented to 3 tables of VIPs to taste. Long service award, best staff award, as well as best lecturer were presented to committed individuals within the SDH team who make significant impacts within and beyond the school.